During last night's wild celebration the Dodgers continued their tradition of thanking the fans directly. Soon after disappearing into the clubhouse they quickly returned with a few bottles of bubbly in hand. 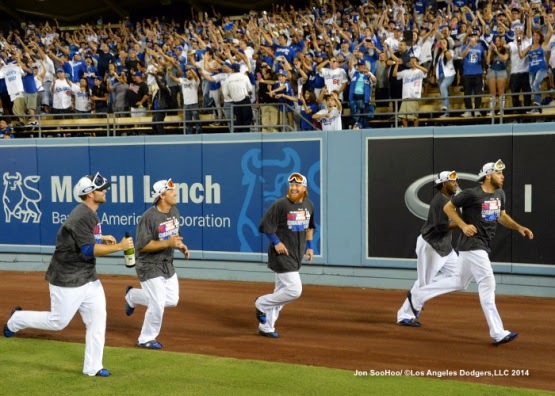 Then they took their traditional lap around Dodger Stadium to the cheers of a still packed house. 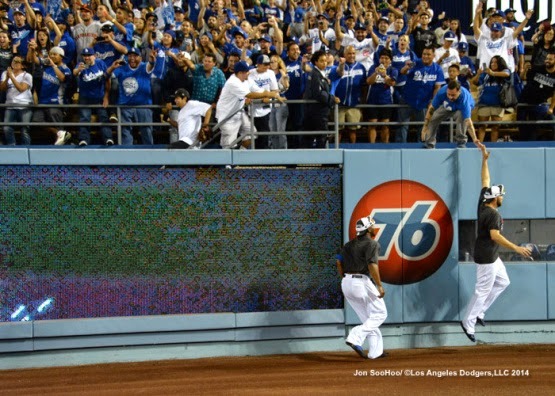 Dodger photographer Jon SooHoo was there to capture the moment on film. Check out his photos directly above and below, or go here to see all of this photos from the evening. Furthermore, throughout the night the good folks within the Dodgers PR department where able to corner several Dodgers for a more personal shout-out to the Dodger faithful. Check them all out below. Andre Ethier, Hyun-Jin Ryu, Yasiel Puig, Matt Kemp and AJ Ellis send out their deepest thanks, via social media. 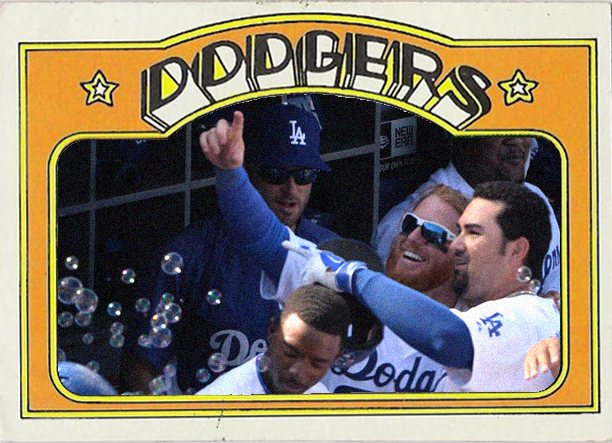 In honor of last night's division winning victory and the good luck charm that got us there, I thought I would share some fantasy Baseball card creations I've been putting together in honor of the vaunted Dodger Bubble Machine. My memories aren't entirely clear but from what I remember it first came into being in early June, and other than a brief respite in NL Commissioner jail it has traveled consistently with the Dodgers ever since. If anybody recalls the exact day or game it made its first appearance please let me know. I think it's important, for the sake of Dodger Blue history, to know these kind of things. Or maybe I'm just a weirdo with an unhealthy obsession with bubbles. 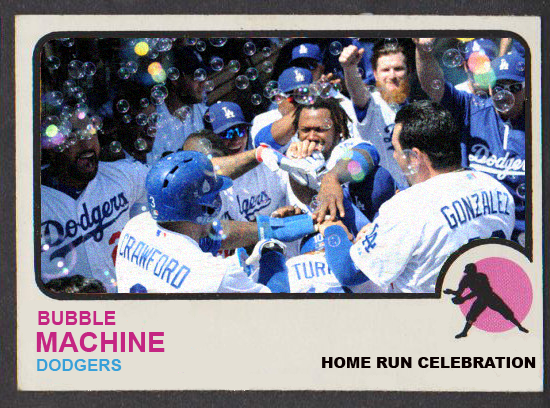 Anyway, the Bubble Machine has been with us through it all and below is my way of honoring it. Check out my fantasy Baseball card creations below. As you know the Bubble Machine has come in many different forms. 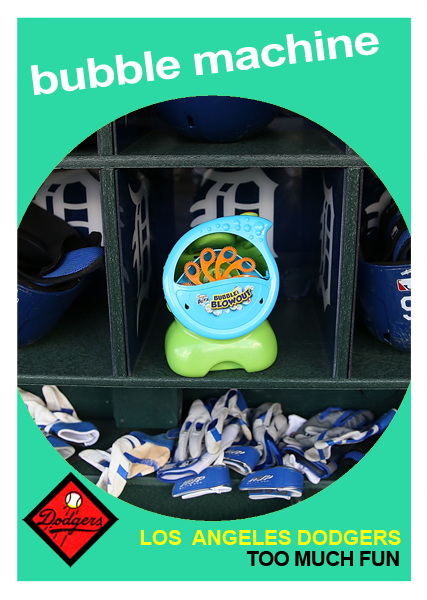 After all, the rough and tumble Major League clubhouse would surely be too taxing for an inexpensive toy contraption like this. 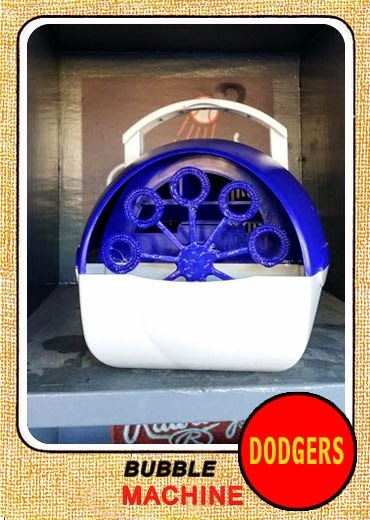 So, there have been many different Dodger Bubble Machines. I have done my best to capture them all. 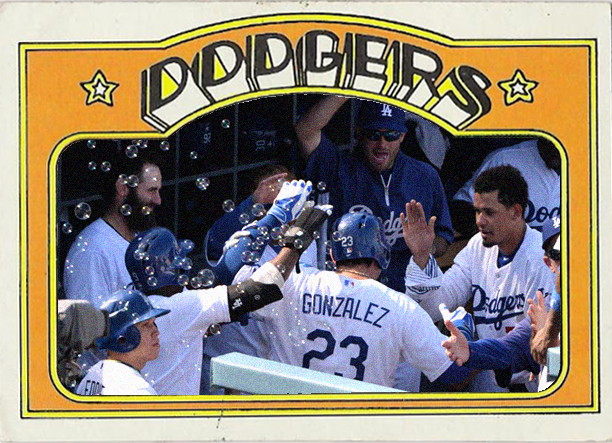 The first fantasy card below uses a photo that was tweeted by the @Dodgers right after it was unofficially banned by the NL Commissioner in early August. The team wanted to let us all know that it had been all packed up and ready to go to Milwaukee. 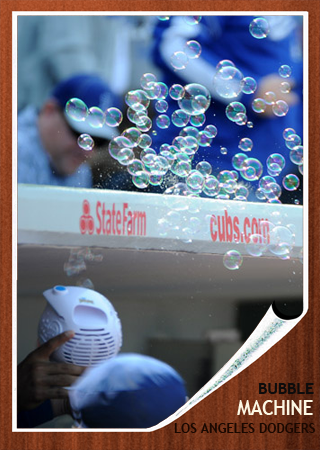 The below fantasy card is of the Bubble Machine featured in the box above. The pic was shared by ESPN reporter Beto Duran on twitter, and taken just before it's banning. I used the vintage 1968 Topps Baseball card design. 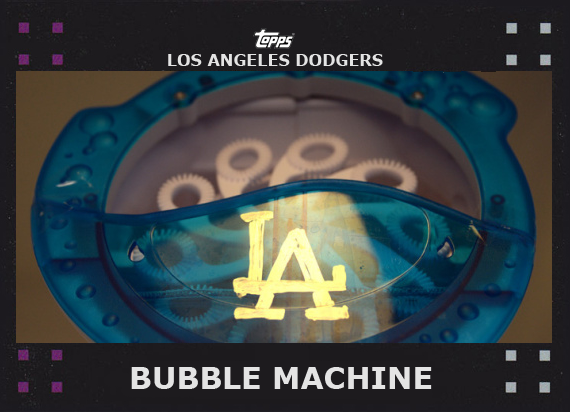 Here's another version of the Dodger Bubble Machine from late August. 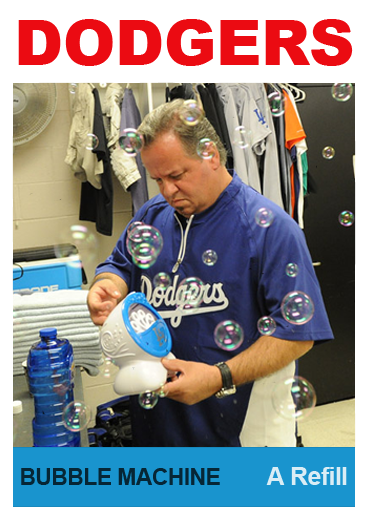 The original photo was taken by Jon SooHoo/LA Dodgers 2014. I believe this next Bubble Machine (on the bottome left) is one of the earliest version, if not THE earliest versions. The original photo was taken in Detroit and shared on CBS (Leon Halip/Getty Images) in early July. The card on the right is from late September and was shared by SportsNet LA on twitter. 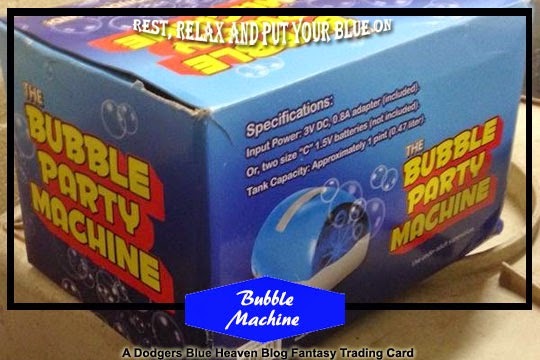 As you can see, by this time they started painting the Dodger logo onto the Bubble Machine. The next series of fantasy cards are "In Action" cards, so to speak. 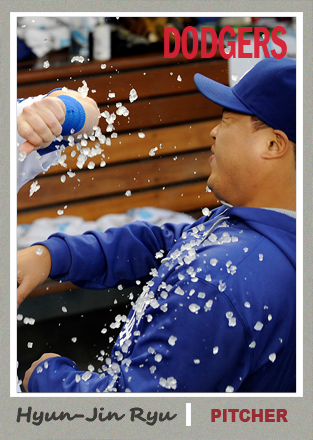 The below card uses a photo taken during the recent roadtrip to Chicago, taken by Jon SooHoo/LA Dodgers 2014. I'm not entirely sure who is holding it up, but I do know they are celebrating one of AJ Ellis' two home runs on Friday, September 19th. Here is something different. The Bubble Machine just doesn't fill itself up. 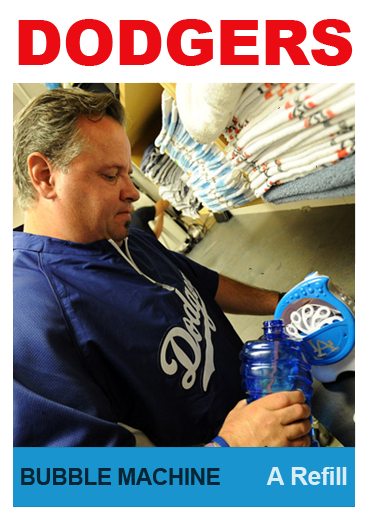 That's the job of Dodger Clubhouse Manager Mitch Poole. 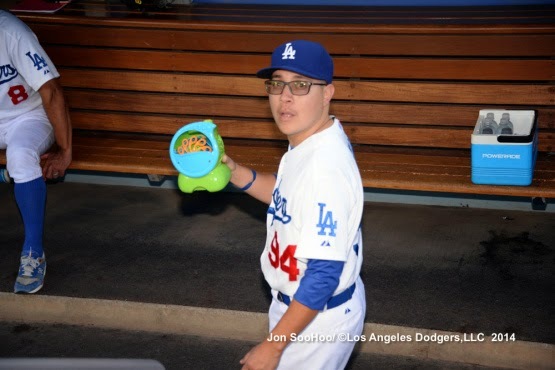 Photos below were taken by Jon SooHoo/LA Dodgers 2014 in mid-September. Here are some classic "In Action" photos using the vintage 1972 & 1973 Topps Baseball card design. You might not see the Bubble Machine, but you sure do see its bubbles. And how could I forget to put up an "In Action" card featuring Clayton Kershaw celebrating his no-hitter (card on the left). This photo was taken by Jon SooHoo/LA Dodgers 2014. On the right is Adrian Gonzalez fiddling with it in late June; also taken by Jon SooHoo/LA Dodgers 2014. These last two fantasy cards have nothing to do with the Bubble Machine. 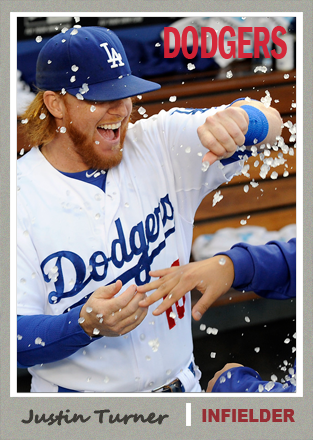 I just loved the photo (taken by Jon SooHoo/LA Dodgers 2014) and had to incorporate it into a couple of cards. I call it "Ryu & Turner's Ice Party." There are so many highlights from last night's celebration it's tough to just pick one, but I think it's fair to say that this might be on top of the list. Juan Uribe, who was so vilified during his first season with the Dodgers, has proven to be an important cog to the Dodger machine the past two season. He's been explosive with the bat and a Jedi on the field, so it should be no wonder that the boy who calls him "Dad" would be every bit as wondrous as him. 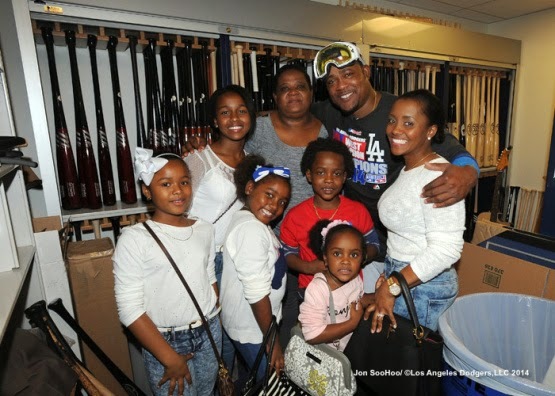 The photo above is of his family, who were in attendance last night, and was taken by Dodger photographer Jon SooHoo/LA Dodgers 2014. The little tyke in red in the middle is the young man I am talking about, and the video below is all the proof needed to prove my point. That lad is cooler that either you or I. Watch it below. The video was taken by ESPN reporter Arash Markazi, so we have him to thank for capturing this for all to see. 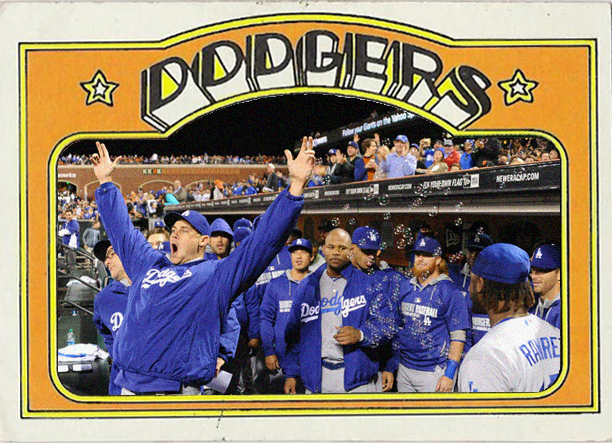 Blog Kiosk: 9/25/2014 - Dodger Links - Bring on the Cards! Winning sure can be exhausting. 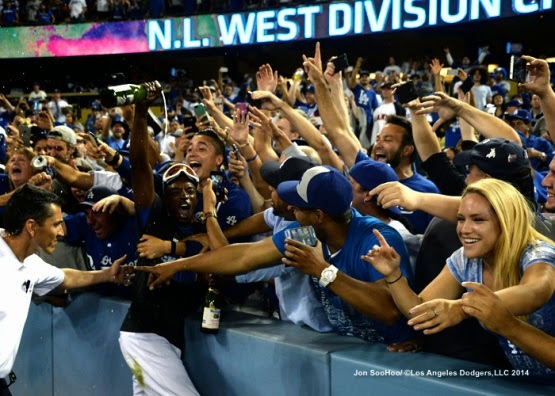 Last night I was full of joy as the Dodgers captured their second NL West Division crown in a row. This morning I am tired from the release of a season long built up of angst, worry and fear. No more do I have to hear the rabble rousing screams of the chattering class declaring our teams lack of class, will or chemistry. Instead, I bask in the glory of Dodger Blue as I await the start of Baseball's second season. You see, the reason we go through this entire exercise, a season filled with 162 maddening games, is to have a chance to compete for the crown. And the only way to get there is to earn an opportunity. This Dodger team has done just that, and this Dodger fan is eternally grateful for their work. So, on to the part of the season that REALLY matters. On to the pageantry and majesty of a national spotlight on national television. On to having an opportunity to watch the "Boys in Blue" compete with the best in the land. On to taking that next step on the road to the World Series. You've done us proud, and I am certain you will not disappoint. There are three games remaining in the season and as you know there is nothing left to chase after. We are the National League Western Division Champions and with the Nationals solidly ahead by two games for the leagues best record, I think it's fair to say that we'll be facing off against the St. Louis Cardinals in the first round of the playoffs. BTW, the gif above of the last out of last night's game is via the Dodgers on tumblr. 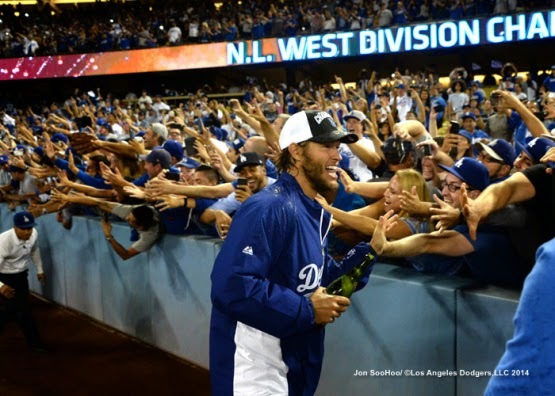 Via Michael Lananna at MLB.com, "After grind of season, Dodgers let loose in celebration." 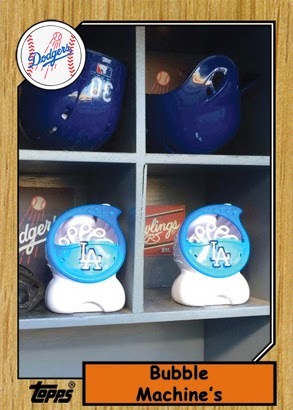 "Let me tell you, this team always has fun -- it's one of those types of teams," said left fielder Carl Crawford, interrupted briefly by Puig throwing ice chips at his face. "You've got to be loose, man. You can't be uptight all the time." "A lot of guys had individual issues throughout the year, but we got here as a team, and that's what the most important thing is," catcher A.J. Ellis said. "Now we're in the tournament, we're all healthy and we're ready to go." Chad Moriyama at Dodgers Digest has up an celebration post including gifs, dancing and moonshine. I kid you not. 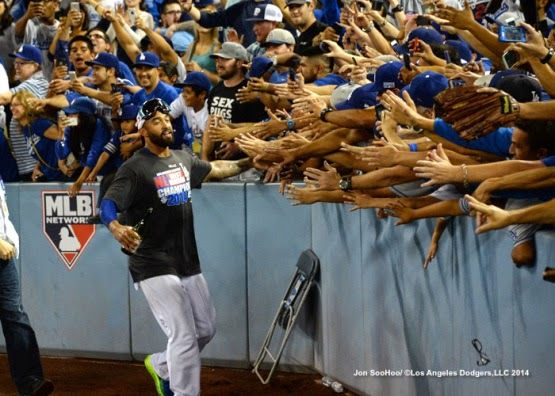 Via Aaron Gleeman at Hardball Talk, "Matt Kemp is playing like a superstar again." 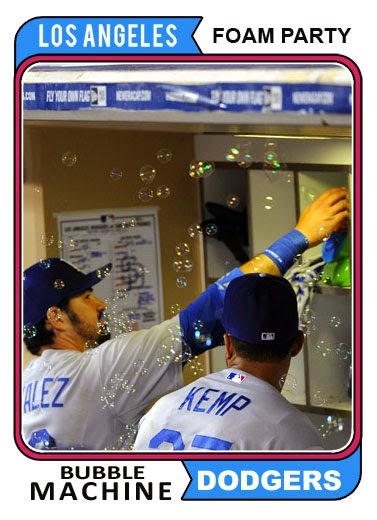 Via Chris Moran at Beyond the Boxscore, "The Dodgers deep lineup will be tough to beat." The point is that Dodgers are healthy, and they can beat you in a myriad of ways. They have speed, power, and on-base skills. Also, with Hanley Ramirez rounding into shape and Matt Kemp recovering his old form at the plate, they are healthier than they've been all year. Via Jon Heyman at CBS Sports, "Diamondbacks set to offer pitching great Dave Stewart the GM job." Mike Petriello at Dodgers Digest also notes that Dodger VP of Player Development DeJon Watson likely appears headed to Arizona also. Boo! He's one of the stars of the Dodger front office. Here's a report by Ron Shah of FanGraphs on Dodger prospect James Baldwin. James Baldwin is one of the most intriguing prospects in the California League. The outfielder checks off all the boxes with his graceful athleticism, tools across the board, and major league bloodlines. But the 23-year-old is currently facing an uphill battle due to his struggles in the batter’s box, which may ultimately deter him from reaching his tools-based ceiling. True to the Blue shares his day with Joc Pederson - at his autograph appearance a couple of weeks ago. Via Cody Ulm at MLB.com, "(Roberto) Hernandez hopes to beat Rox, earn playoff role." Hernandez showed enough promise with three quality starts in his first four tries for the Dodgers after the team acquired him from the Phillies in early August. But since then, he's failed to last longer than 4 1/3 innings in his four most recent starts, surrendering 11 runs in 15 innings. I'd be surprised, but good luck.